Dave is a New York City based performer and music educator. 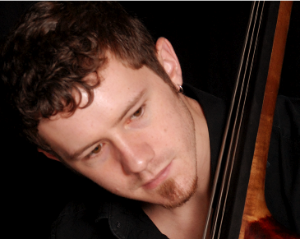 He specializes in the upright and electric bass and holds a BM from New York University in Music Education. As a performer David has played in many countries all over the Americas and Europe where his bands have been featured in events such as The Umbria Jazz Festival, Canadian Music Week, Ancona Jazz Festival, Django Reinhart Festival, Jazz En Touraine, Festival de Jazz de Colmar, South By Southwest, Berks Jazz Festival, Cape May Jazz Festival and NYC’s After the Jump Festival and CMJ (College Music Journal). In addition to playing with Bipolar, David has been fortunate to share the stage with musicians and groups such as Pat Martino, Eric Alexander, Bryan Scary and the Shredding Tears, The Regulars., Guns and Drums, Bazaar Royale, Bionic Twitch, C.B. Savage, The Nikhil P. Yerawadekar Quintet (NPYQ), K-Ensemble, Maricopa, The Laura Thomas Band, American Popular, Down By Sound, Brian Duran's 'Quiet Riot,' Body of Sound, Little Australia, The Tom Wherrett Trio, Marco Bosco, hip-hop artist ETERNAL and Uptown System, Ruby Bullet, Scott Kacenga, Alan Leatherman, Pepperspray (RHCP Tribute) and Cowboys From Hell (Pantera Tribute).